New Engineering Pet! 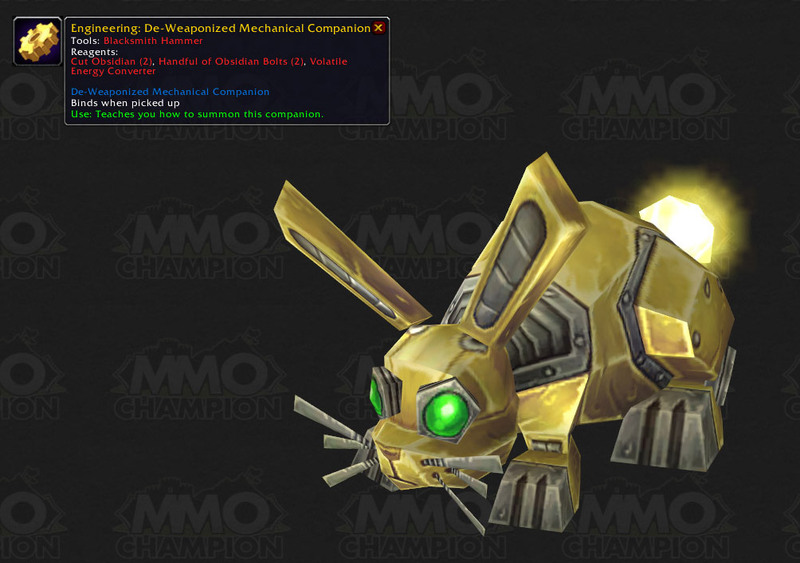 Picture This pet is added as of the Cataclysm expansion and is a mechanical rabbit with a glowing light for a tail. :) Pretty cute little guy. I demand a larger version as well, to use as a mount. Requires Gnomish engineering to make! Oh, i know! Let's call him Jasper! Dunno why this comment have been downrated. It DOES require gnomish engineering to make, and it is learned from gnomish engineering masters only. Another example of what the wowhead achievement Harcore Critic is doing to the database. When I brought this up in a forum post here on Wowhead a blue shot me down, but examples of this keep popping up! Save our comments! Join in on the protest against this destructive achievement! Beware of the rabbot. He has been known to crush houses. Pretty sure this is the same guy. Possibly Blizzard changed the level requirement. Although engineering level listed for making this recipe is still listed as 475/495/497/500, the recipe is still red with 509 skill level, only becoming green at 514.